Yesterday I finished reading two books. I read Havah by Tosca Lee the old-fashioned way and Frankenstein by Mary Shelley I listened to by audio book in my car. I couldn’t help seeing the similarities in subject matter. Havah is the fictionalized story of Eve written in beautiful prose of a lyrical quality. I could visualize the Garden of Eden and then, after the fall, feel the agony as weeds and sin and death crept in to take over the earth. The close commune Adam and Eve had with the Creator was severed. And Havah longed for the fellowship to return. From the Prologue: I have seen paradise and ruin. I have known bliss and terror. I have walked with God. And as she dies in the last chapter: Sleep–I can see the earth as it was, the green without the fire, the lightning, the river flooding it. I once feared death but now consider it a grace not to be trapped in this life or this body forever, with its wrinkles and ravages and this searing pain, with its aging and heartbreak. And while death was something she could have avoided by not eating the fruit of the tree of knowledge of good and evil, death became something in the end she longed for, because with death, she was able to once again be with her Creator. The monster created by Frankenstein wanted companionship. When no one befriended him, not even his creator, he began his reign of terror. Once I falsely hoped to meet with beings who, pardoning my outward form, would love me for the excellent qualities which I was capable of unfolding. I was nourished with high thoughts of honour and devotion. But now crime has degraded me beneath the meanest animal. No guilt, no mischief, no malignity, no misery, can be found comparable to mine. When I run over the frightful catalogue of my sins, I cannot believe that I am the same creature whose thoughts were once filled with sublime and transcendent visions of the beauty and the majesty of goodness. But it is even so; the fallen angel becomes a malignant devil. Yet even that enemy of God and man had friends and associates in his desolation; I am alone. And Frankenstein regretted making this fiend. Mary Shelley, as she wrote Frankenstein,may have felt like her creature. Maybe she felt abandoned and alone by her creator. Maybe she felt her transgressions were so great that nothing could correct them. Maybe you feel this way. 14 Since the children have flesh and blood, he too shared in their humanity so that by his death he might break the power of him who holds the power of death—that is, the devil— 15 and free those who all their lives were held in slavery by their fear of death. 16 For surely it is not angels he helps, but Abraham’s descendants. 17 For this reason he had to be made like them,[k] fully human in every way, in order that he might become a merciful and faithful high priest in service to God, and that he might make atonement for the sins of the people. 18 Because he himself suffered when he was tempted, he is able to help those who are being tempted. And he is still accessible to us today. We are not alone. 15 “If you love me, keep my commands. 16 And I will ask the Father, and he will give you another advocate to help you and be with you forever— 17 the Spirit of truth. The world cannot accept him, because it neither sees him nor knows him. But you know him, for he lives with you and will be[c] in you. 18 I will not leave you as orphans; I will come to you. He promises not to leave us as orphans–not to leave us alone. Note: This is not the first time I’ve read a book and at the same time listened to another that correlated in some way. Coincidence? I don’t know. But I know that I am grateful that I was able to “read” these two at the same time. Why was I reading Frankenstein? Because my current work-in-progress(novel) is set in 1819 and Frankenstein was published in 1818, so my characters may have read the book. I thought I’d read what they may have. Update to this post: I wrote this early in the morning before work. When I got to work I had an email in my inbox with this subject line: Lonely | Encouragement For Today | Proverbs 31 Ministries . Please click the link to read. Is this just another coincidence? The theme for the 2011 Blue Ridge Mountains Christian Writers Conference(aka Revival) was “Write Courageously”. Our first keynote speaker, Retired Army Ranger and Chaplain Jeff Struecker, knows a little bit about courage. He lived through the events portrayed in the movie Black Hawk Down and told us of how he transitioned from Ranger to Chaplain because the other men in the operation began coming to him for counseling. You see, he had something that the others didn’t have—peace in the knowledge that no matter what the outcome of the mission, he was going home—either to his wife or to his Father in Heaven. He knew. Warning: There is violence in this video–the story cannot be told without it. Praying a very specific prayer with Cecil Stokes. Being taught and critiqued by script consultant, Dr. Linda Seger. Edie Melson talking about her son gearing up for deployment. Eva Marie Everson talking about her mother at last year’s conference(I didn’t cry until I was sharing her story with my husband after I got home). Sharing a meal with Deborah Raney, Yvonne Lehman, Jim Watkins, Ramona Richards, Aaron Gansky, Nancy Lohr, and the many conferees who shared their personal stories. Angela Hunt instructing us on how to use Scrivener. Crying as Janet Roller led us in worship. Laughing with keynote speaker, Jane Herlong. Christy award finalist, Gina Holmes, offering to critique the first few pages of my manuscript. Experiencing the Staff talent show (How could you forget?). Pitching to Ramona Richards (my one sheet was very misleading— I didn’t realize the connotation it would have in other people’s eyes) –she gave me permission to submit it after I explained what I meant. Pitching to Film Producer, Christy Lee Taylor—started out with my screenplay Poison Ivy Bride(bombed), then my full manuscript, Absalom’s Beauty(bombed), but my little humor story, Eve’s Apple, received a request for the treatment. It takes courage to come to conference and put your ideas out there. Sometimes you’ll face rejection, but sometimes, you just might find success. But you have to go out there and do it. If I had one regret in my experience is that I did not seek out the opportunities to fellowship outside the cafeteria. I am an early-to-bed person(aka boring), so I miss out on what was called “the afterglow”. Did I mention that Blue Ridge Mountain Christian Writers Conference is the highlight of my year? Thanks Alton Gansky and Edie Melson for a wonderful worshipful time! 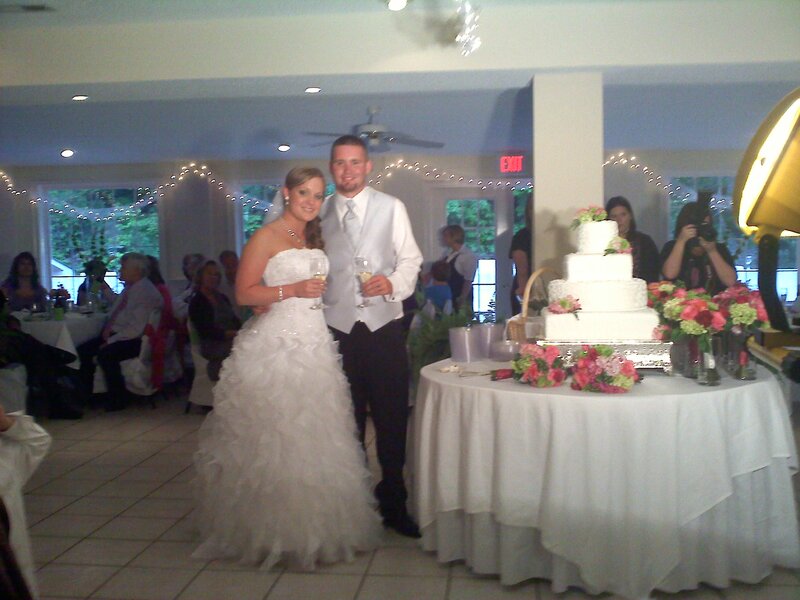 Congratulations to Katie and Michael Whitfield on their marriage. I loved the ruffles on Katie’s wedding dress so I asked her permission to use their pictures on my blog. The pictures were taken from my camera phone because my regular camera’s battery was dead. I came across a sentence in my novel that was passive. I almost changed it, but then realized I couldn’t. A wooden ladder was lowered on their side of the hedge and unfolded to form its pyramid shape. Because the subject, the ladder, is not taking action, someone else is doing the action to it. Of course, a ladder cannot do anything without the help of someone else. Could I have said? : A ladder lowered on their side of the hedge. Almost implying the ladder lowered itself, which cannot happen. But this sentence doesn’t sound bad. I could have said: The butler lowered a ladder. That’s an active sentence. The butler(the subject) is doing the action. However, in my story, the point of view character cannot see who is lowering the ladder, so I could not use that sentence. I could have said: Someone lowered a ladder. But I’m not sure I like that sentence. Any comments on how it should be written differently?